The European Report on Development (ERD) is an influential and independent report that aims to stimulate debate and research on topics of major relevance for development and to enhance the European perspective in international development. The fifth edition of the ERD (ERD2015) has the theme of “Combining finance and appropriate policies to enable a transformative post-2015 development agenda”. The ERD2015 will be launched on May 4th in Brussels – watch the teaser trailer and sign up for the launch event. A preview of the emerging messages of 2015 European Report on Development was made at the OECD Global Forum for Development this week. Recently, ECDPM’s James Mackie was invited to present the emerging messages of the report to a joint seminar hosted by the EU Delegation to Japan and the Japan International Cooperation Agency. Regional cooperation and integration in Africa are highly complex processes. The interests of state and non-state actors in such processes and the power they hold differ within countries and among countries. Often, the outcomes of regional cooperation are hard to predict, with the costs and the envisaged benefits unevenly spread over time among the interested stakeholders. 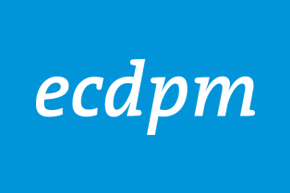 Despite these complexities, this ECDPM Discussion Paper argues that these times offer good opportunities for domestic policymakers, regional organisations, non-state stakeholders and donors to engage purposefully in such regional enterprises. It points to opportunities and to new research that helps understand shapers and blockers of regional cooperation and helps identify opportunities and prioritise for politically and technically feasible support strategies. ECDPM and the IDL Group are currently undertaking a study, to be published in September, on the drivers and obstacles to regional cooperation and integration in Africa on behalf of the Swedish Embassy in Nairobi. The Partnership Platform taking place next week in Johannesburg is the key annual event of the Comprehensive African Agriculture Development Programme (CAADP). This year is particularly important because it’s the first platform meeting since the 2014 Malabo Declaration which introduced ambitious commitments for agricultural growth and transformation in Africa to be reached by 2025. ECDPM’s Head of the Food Security Programme, Francesco Rampa, argues in his latest Talking Points blog post that Regional Economic Communities (RECs) should have a stronger role in CAADP implementation. RECs, he says, are better positioned than continental institutions in helping Member States in their own CAADP processes. Rampa will be in Johannesburg raising this and other issues. Follow him on Twitter to know more of the day to day discussions at the CAADP Partnership Platform. Imperative Sahel strategies | From crisis to stability – is education a shortcut? | The ACP-EU Partnership Post-2015? The Sahel has been at the centre of international and regional efforts to solve the multiple crises that affect the region – lack of security, terrorism threats, governance failures and food insecurity. The Sahelian strategic environment has become more and more crowded as international and regional organisations propose their own solutions to tackle this multiplicity of challenges. At the request of the Bamako Ministerial Coordination Platform for Sahel Strategies and Initiatives, ECDPM and ISS Dakar have undertaken a mapping and comparative analysis of Sahel strategies and initiatives of regional and international actors. On paper, the identification of the Sahel issues are broadly shared, but in reality the various strategies play out in different ways, and there is a risk that competition supersedes coordination in the Saharan-Sahelian region. This article was published in GREAT Insights Volume 4, Issue 3 (April/May 2015).